The First World War was fought between European States which had colonial empires. When war was declared in 1914, Namibia (then known as German South-West Africa had been a colony of Germany for 30 years. Although the discovery of diamonds in 1908 had attracted many settlers, it was still sparsely populated and defended by fewer than 5000 German soldiers. Brittain asked the Union of South Africa (then part of the British Empire) to perform an “urgent Imperial service” : take control of the ports of Luderitz and Swakopmund and destroy the wireless station at Windhoek. This was the tallest in Africa, powerful enough to communicate directly with Germany in good conditions. By denying the German Navy communications and friendly harbours, vital shipping would be protected. In September 1914, South African forces prepared to destroy the Swakopmund harbour facilities and wireless station by naval bombardement, land a force to secure Luderitz, and send two other forces overland from the south and south east. Force A crossed the Orange River, capturing Raman’s Drift, but an advance guard sent to the next water source was encircled at Sandfontein on 26 September and had to surrender after several hours of fighting.. Meanwhile Luderitz was occupied on 18- 19 September after German Forces had withdrawn inland, destroying the railway line behind them. More South African forces arrived in early 1915 and a renewed campaign began in February, Vastly outnumbering the German troops they advanced inland from Swakopmund and Luderitz and from across the Orange River and the Kalahari. Difficult desert conditions and long supply lines resulted in shortages of water and food. Supplies, includingwater, had to come from Cape Town by ship before being transported by rail, wagon or truck. Hundreds of kilometre of new railway track were laid and many thousands of railway workers , labourers, scouts, couriers, drivers and drovers – most of them indigenous men of South Africa and South West Africa – played a vital role. 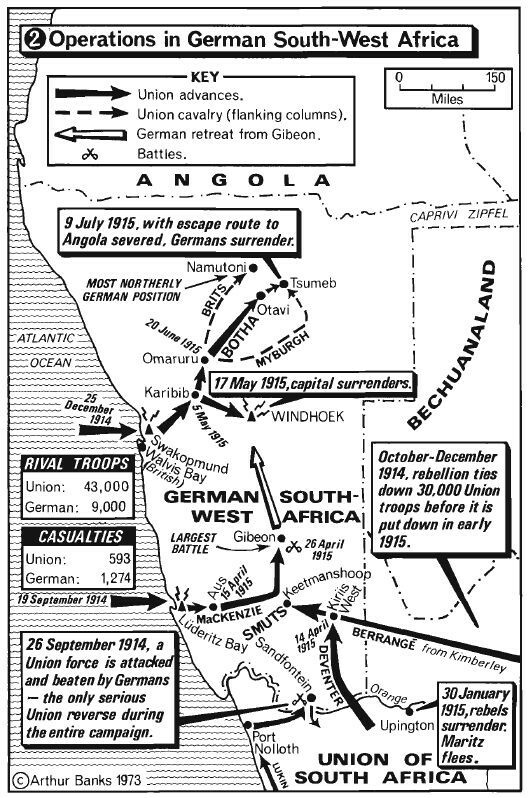 South African units isolated and surrounded German forces as they moved inland. During the night of 26-27 April a mounted rifle force surpised the German Contingent at Gibeon after covering 335 kilometers of desert in eleven days. Bright moonlight enabled the Germans to counter attack, killing several riflemen, Fighting continued into the daylight when the South African force made another assault. German troops abandoned their positions escaping to join units in the Windhoek area. On 12 May 1915 Windhoek was occupied. The remaing German troops retreated north towards Tsumeb, harried by the mounted troops and infantry covering an average 22,5 kilometers per day. German commanders surrendered at Khorab at kilometre 500 of the Swakopmund Otavi railway on 9 July 1915. 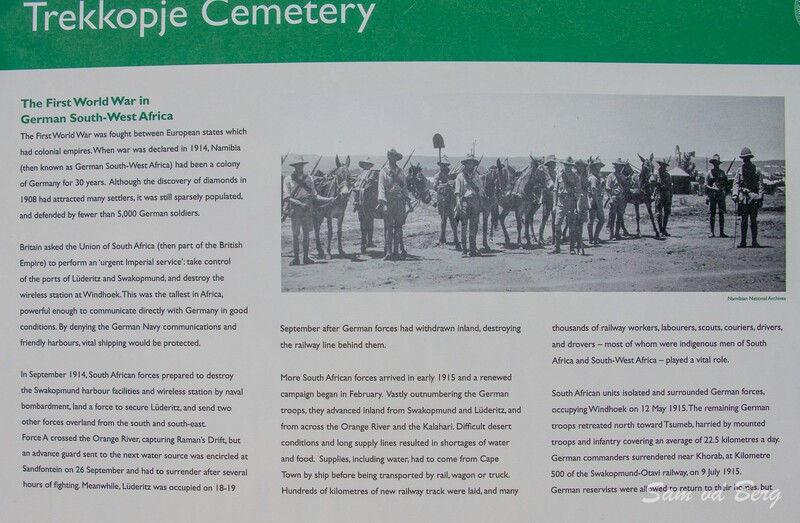 The Commonwealth War Graves commission commemorates about 600 servicemen of the First World War in Namibia, including members of the British Empire units as well the German Forces across 40 sites. A third of these men died during the 1915 campaign . A further third died in October and November 1918 either while interned or garrisoning the territory during the global influenza pandemic. Namibia Accommodation wishes to thank and compliment the Commonwealth War Graves Commission on their excellent work and efforts to maintain the graves and tell the story of the fallen heroes on both sides.